The year 1966 was a turbulent one for Atlanta and its ongoing march toward integration. “Separate but equal” was slowly falling by the wayside as an enlightened populace realized the term just meant continuing more of the one-sided segregation that keep the races separate but truly unequal. That was the year Hank Aaron hit his 400th home run. But even his rock star status in such a segregated society prevented him from enjoying the full privileges of being an American, much less an African-American. On September 6 race riots, symbolic of that century of pent-up black oppression, erupted in The City Too Busy to Hate. 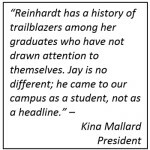 But while Atlanta burned to the south, Waleska to the north took a bold step into the future as James T. “Jay” Jordan walked onto the campus of Reinhardt College. Jordan’s first steps into the future as the school’s first African-American student charted a new course for the college, now Reinhardt University. His unintentional legacy will be recognized this month, along with other notable events surrounding that historic event 50 years ago. Reinhardt’s observance of Black History Month will continue throughout the month of February as it features the many accomplishments and proud heritage of African Americans. The annual observance will include symposiums, performances, and film screenings, with the cornerstone being the celebration of the 50th Year of Integration of the university. And it all began with Jordan’s simple quest for a higher education from a small, private liberal arts college near his hometown of Canton. That eight-mile drive changed Jordan, as well as his classmates, forever. “Reinhardt has a history of trailblazers among her graduates who have not drawn attention to themselves. 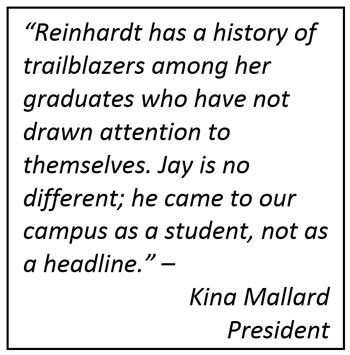 Jay is no different; he came to our campus as a student, not as a headline,” says President Kina Mallard. “This is the time to recognize him for his contribution to our history and for his accomplishments to society far beyond our walls. Jordan’s place in history – as well as those of other prominent African-Americans – will be celebrated and open to the public free of charge. All events will be held in Bannister Glasshouse, Hasty Student Center. Tuesday, February 16, 5 p.m. to 6:30 p.m. This event will feature master drummer Sister Yomi for a workshop on African style dancing and drum playing. 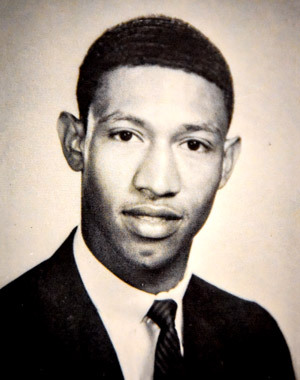 Thursday, Feb. 18, 3:30 p.m. to 5 p.m.
During this event, special guest James T. “Jay” Jordan, the first African-American student enrolled at Reinhardt, will discuss his life and experiences as a student when he entered Reinhardt in 1966. The symposium will be moderated by Reinhardt History Professor Dr. Kenneth Wheeler.In addition to recognizing James Jordan, there will be a lecture by historian Dr. Edith Riehm, who has studied President Truman’s Committee on Civil Rights and the post-World War II civil rights movement. Dr. Riehm will discuss the unheralded trailblazer role that Reinhardt alumna, Dorothy Rogers Tilly, Class of 1899, played in the Civil Rights Movement.Tilly devoted her entire adult life to reforming southern race relations. Her extensive career as an activist, organizer, and mentor forged a link between the reform efforts of the early twentieth century and the modern civil rights movement. She worked with the Women’s Missionary Society of the Methodist Church, the Commission on Interracial Cooperation, the Association of Southern Women for the Prevention of Lynching, the Southern Regional Council and the Fulton-DeKalb Commission on Interracial Cooperation, and the Fellowship of the Concerned (FOC).In 1946, President Harry S. Truman appointed Tilly to his Committee on Civil Rights. The Committee produced a famous and influential report, “To Secure These Rights,” which called for an immediate end to segregation. To the end of her life, through example and education, Tilly promoted racial tolerance and acceptance of desegregation during the explosive years of the civil rights movement. Friday, Feb. 19, 8 p.m. to 10 p.m. The Office of Student Activities will host the screening of baseball great Jackie Robinson. The film covers Robinson’s signing with the Brooklyn Dodgers organization in 1945 to his historic 1947 season when he broke the color barrier in Major League Baseball. Tuesday, Feb. 23, 8 p.m. to 9 p.m. Poet and public speaker Lady Caress will appear on the Reinhardt campus with her unique set of comedy, music, beat boxing and theatrics. For more than 10 years, Lady Caress has dedicated her life to the art of communication as both a poet and public speaker.As a National Poetry Champion in 2010 at Pi Kappa Delta, Lady Caress has continued to impact audiences outside of the performance realm. She has designed and executed public speaking and poetry workshops for Upward Bound, YMCA and S.T.A.R.S., an organization designed to bring extra-curricular activities to at-risk youth.She served as Spoken Word Poetry Consultant for Iowa’s National Night Out and coached both high school and collegiate students in competitive Poetry and Prose performance pieces. While her work often extends to off stage ventures, she still captures audiences with her unique set of poetic nuances.She has featured at The Marshall Arts Room, Love Jonz Spoken Jazz Set, and Sunday Spoken in Dallas, TX. She has performed at Bus Boys and Poets in Washington, DC, Say What Poetry in Des Moines, IA, and placed first twice at the Jacksonville, FL, Amateur Night at the The Ritz Theater in Fall 2013.